Researchers have designed a way to improve the safety and efficiency of a complex surgical procedure for children with cerebral palsy by using wearable technology like Google Glass. 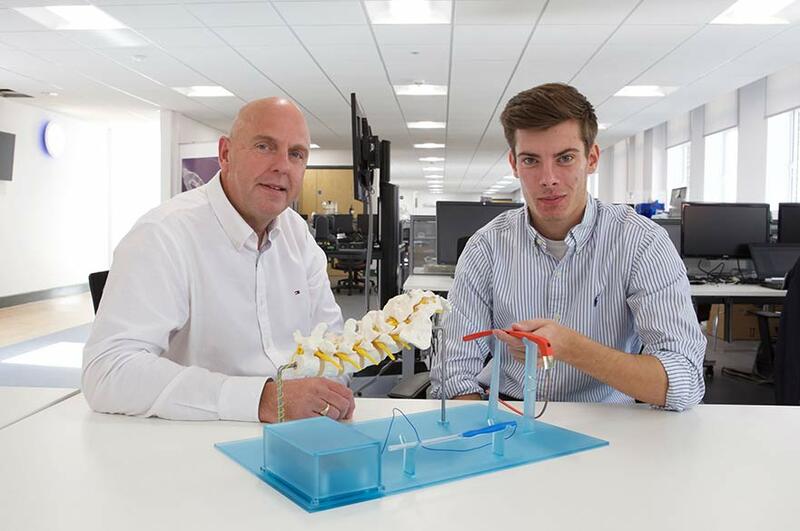 The design, by Nottingham Trent University in collaboration with Nottingham University Hospitals NHS Trust, allows clinicians to be given crucial surgical information live in theatre via an optical head-mounted display unit during the operation on a child's spine. The procedure – a selective dorsal rhizotomy – involves the severing of two-thirds of a nerve root in order to improve the muscle stiffness which children with cerebral palsy experience in their limbs. Currently a surgeon has to perform this operation based on information relayed to him verbally by a colleague on a screen elsewhere in the operating theatre. But the new design will project the information – which presents how responsive the nerves are – onto the lens of the optical head-mounted display, so he can monitor it while performing the surgery. "This example proves the feasibility and is a token of the possibilities this technology has in teaching and training, supervision and 'live' second opinion in uncommon procedures." This design allows a surgeon to analyse crucial data in his line of sight, hands free in real time. The research has been led by Professor Philip Breedon, a professor of smart technologies in Nottingham Trent University's Design for Health and Wellbeing Research Group in consultation with Professor Michael Vloeberghs, a professor of paediatric neurosurgery and Honorary Consultant Paediatric Neurosurgeon at the Nottingham University Hospital. It was developed by postgraduate student Mark Golab as part of his MSc in Medical Product Design at Nottingham Trent University. "This design allows a surgeon to analyse crucial data, in his line of sight hands free in real time, without the need to look away from the working field of view and communicate across the operating theatre while he's performing this procedure," said Mark, 22, who is originally from Cambridge. "This improves the efficiency of this surgical procedure while also allowing the surgeon to have a better understanding of live information which he needs in order to perform the operation." A tiny exterior-facing camera on an optical head-mounted display unit will also enable the surgeon's perspective of the operation to be broadcast live to a third party. This is a fantastic example of how advances in technology can be applied to help improve critical medical procedures. Press enquiries please contact Chris Birkle, Press Officer, on telephone +44 (0)115 848 2310, or via email; or Helen Breese, Media Relations Manager, on telephone +44 (0)115 848 8751, or via email. Businesses must strive for a balance which places equal value on the presence of men and women in the boardroom, the leader of one of Britain’s top business groups says.